Ships today if you order in the next 6 hours 26 minutes. Auto Ship & Earn + 147 Points What's this? 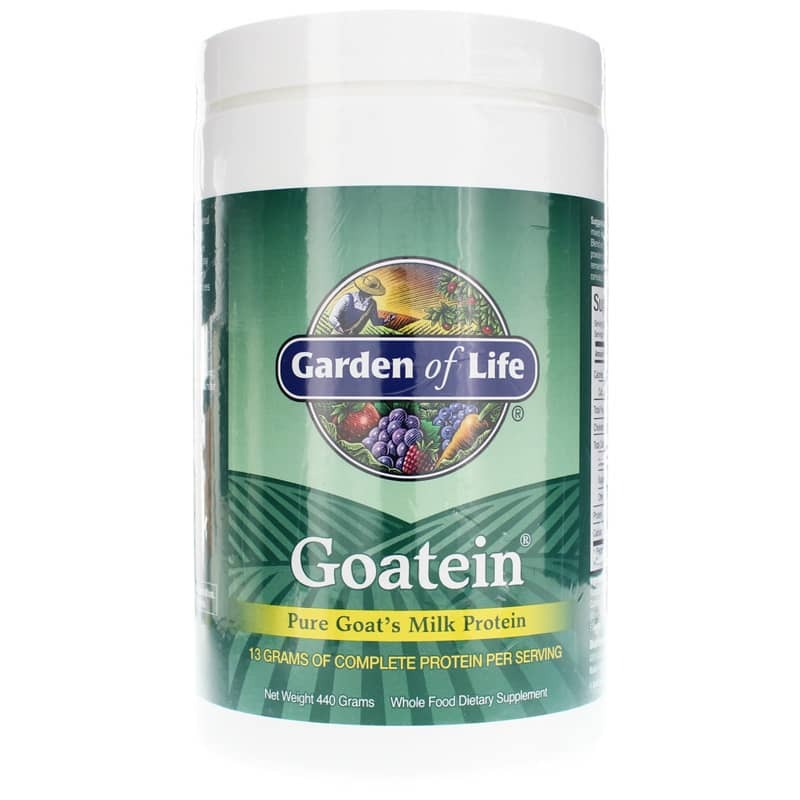 Garden of Life Goatein is a complete, easy-to-digest source of protein from goat's milk that may be suitable for people who cannot tolerate cow's milk sources. Proteins form the foundations for muscles, skin, bones, hair, teeth, blood, the brain, the heart, and billions of biochemical activities in the body. They play a part in immune health, blood cell formation, and hormone synthesis. Proteins are made up of 20 amino acids, eight of which are considered 'essential' because your body cannot produce them and we have to get them from the food we eat. Our bodies break down the dietary proteins we eat into amino acids, which it then uses to produce new proteins as needed. So, protein is essential to good health. And animal protein, such as that from goat's milk, is the only complete source of protein. Vegetarian sources of protein, such as soy, are generally missing one or more of the essential amino acids, even if their protein content is high. And vegetable proteins are often produced from non-organic or genetically modified organisms and may contain chemical residues. Goatein, on the other hand, is derived from the milk of goats raised without antibiotics or growth hormones. And the protein goat's milk differs from that in cow's milk, and may be suited to people who cannot tolerate milk from bovine sources. 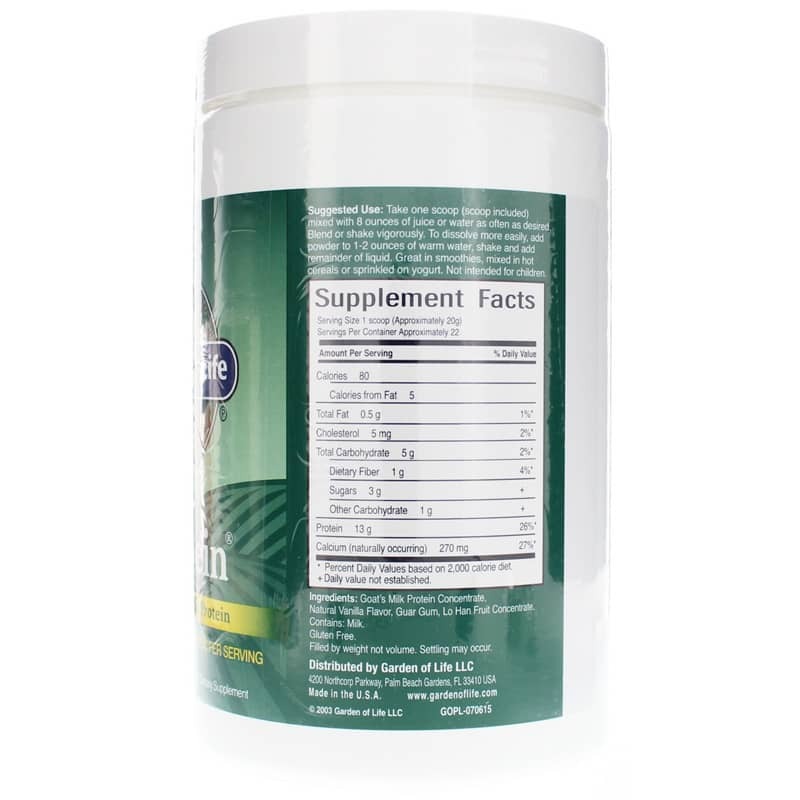 Goatein may also help those on a low carbohydrate diet who are looking to supplement with high quality protein. 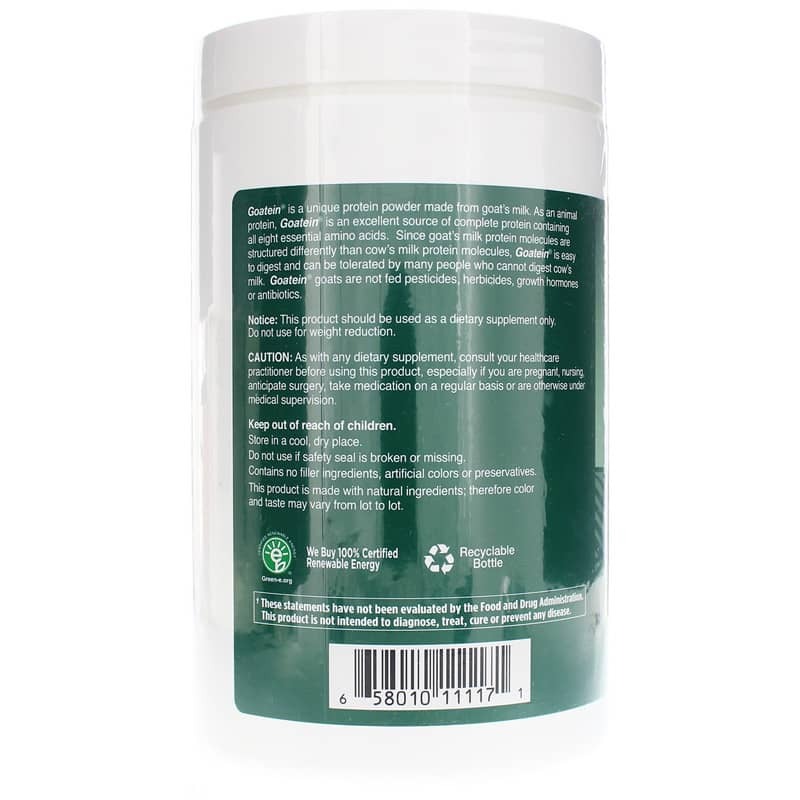 Ingredients: Goat's milk protein concentrate, natural vanilla flavor, guar gum, lo han fruit concentrate. Contains milk. Contains NO: gluten, filler ingredients, artificial colors or preservatives. Adults: Take one scoop mixed with 8 ounces of juice or water as often as desired. Blend or shake vigorously. Great in smoothies, mixed in cereals or sprinkled on yogurt. Not intended for children.